Scituate's Will Sheskey broke the program record for rushing yards in a single season and guided the Sailors to their first Super Bowl in program history on Saturday (Photo Courtesy: Andrew Bowman). Friday night and Saturday served as a celebration of the 2018 Massachusetts High School Football season as the Super Bowls across all eighth divisions were played at Gillette Stadium. Nashoba got things started on Friday by winning its fifth championship in program history as they cruised past Dighton-Rehoboth, 31-0, in the Division 4 Super Bowl. In the nightcap, North Andover prevented a three-peat from King Philip as its defense pitched a shutout including halting three drives inside the 35-yard line to come away with a 6-0 win in the Division 2 Super Bowl. In the Division 8 Super Bowl, St. Bernard's outlasted Pope John, 46-35, behind a dual rushing attack from Xavier Marty and Walter Morales. The game was the second highest scoring total in Super Bowl history. After falling in last year's Super Bowl, Blackstone Valley Tech earned a second chance and took full advantage shutting out St. Mary's, 18-0, to win the Division 7 Super Bowl. Guided by the S and S tandem of Aidan Sullivan and Will Sheskey, Scituate captured its first Super Bowl in program history with a 35-14 win in the Division 5 Super Bowl over Nipmuc. 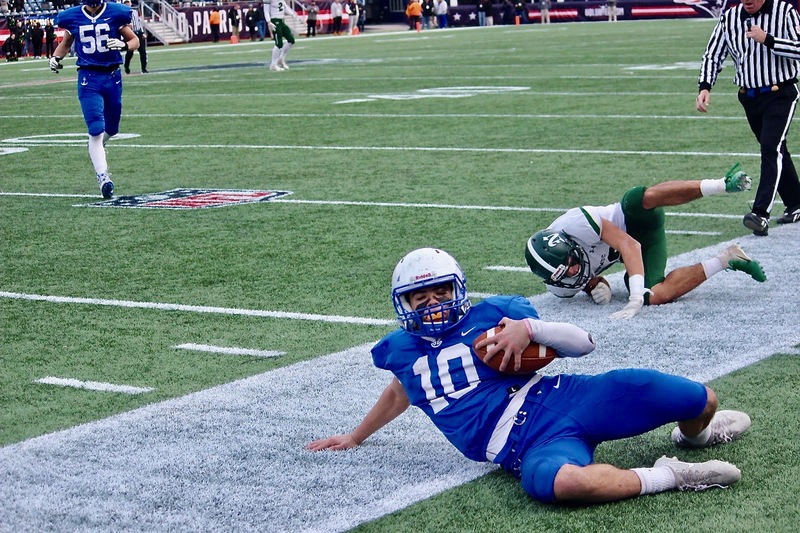 Christos Argyroplous turned a potential heartbreaking loss for Stoneham into an incredible victory as his 42-yard touchdown run pushed the Spartans over the top versus Old Rochester, 26-20, in the Division 6 Super Bowl. Springfield Central became the first Western Mass. program to win a state-wide Super Bowl as Isaac Boston's prowess in all three facets of the game led the Golden Eagles past Tewksbury in the Division 3 Super Bowl, 20-7. Then, in the final game of the day, St. John's Prep left little doubt about its standing in Division 1 as it outscored Catholic Memorial 21-0 over the final 12 minutes to defeat the Knights, 40-22, to win its first Super Bowl since 2012. Here are our top 10 performers from Super Bowl weekend. Rockett was sensational in Saturday night's Division 1 Super Bowl reeling in nine receptions for 188 yards, and three touchdowns. The senior also added an interception as St. John's Prep claimed the Division 1 State Championship with a 40-22 win over Catholic Conference rival Catholic Memorial. As he has done all season long, DeSouza did a little bit of everything for the Scarlet Knights on Friday night. The senior hauled in five receptions for 64 yards and captained North Andover's defense alongside Darren Watson, coming through with a crucial breakup with 4:40 to play as the Scarlet Knights finished a perfect season with a 6-0 win over King Philip in the Division 2 Super Bowl. Bostton did it all for Central on Saturday night, using his arm, legs, and even talents on special teams to lead the Golden Eagles. The senior quarterback went 9-of-11 for 153 yards and a touchdown through the air, while also returning a muffed punt seven yards for a second score as Springfield Central became the first Western Mass. team to claim a state championship with a 20-7 win over Tewksbury in the Div. 3 super Bowl. One season after suffering a broken leg that sidelined him during the Division 4 Super Bowl, Bolinsky led his team to victory. The senior quarterback finished 10-of-18 for 250 yards and a touchdown as Nashoba won its fifth state championship with a 31-0 win over Dighton-Rehoboth. It was a record-breaking day for Sheskey. The junior running back rushed for 207 yards and two touchdowns, breaking the single season program record for rushing yards with 1,762 total for the 2018 season to lead Scituate to its first Super Bowl in program history with a 35-14 win over Nipmuc. Sullivan bolstered his player of the year candidacy on Saturday, finishing 11-of-15 for 169 yards and three touchdowns to complement Will Sheskey's performance in the Sailors Division 5 Super Bowl victory. Despite fumbling midway through the fourth quarter, Argyropoulos refused to be phased as he broke three tackles and found the end zone for the game-winning 42 yard touchdown run in the Division 6 State Final as Stoneham captured its first Super Bowl with a 26-20 win over Old Rochester. Argyropoulos finished with 113 yards and a score. The Beavers quarterback inflicted damage on the St. Mary's defense with his legs rushing for 96 yards on 16 carries and two touchdowns as Blackstone Valley Tech avenged last season's loss with a 18-0 win over St. Mary's in the Division 7 Super Bowl. Alongside fellow back Xavier Marty, Morales led a St. Bernard's offense that was unstoppable on Saturday morning. Morales finished with seven carries for 42 yards and two touchdowns on the ground, while also adding 51 yards and a third touchdown in the passing game. Behind Morales' prowess, the Bernardians took down Pope John, 45-34, to win the Division 8 Super Bowl. Smith-Howell capped off a standout sophomore season in style. The Tigers' lead back rushed for 116 yards on 19 carries and two touchdowns, highlighted by a 55-yard run for a score, while also adding a 34-yard touchdown reception in Pope John's 46-35 loss to St. Bernard's in the Division 8 Super Bowl.